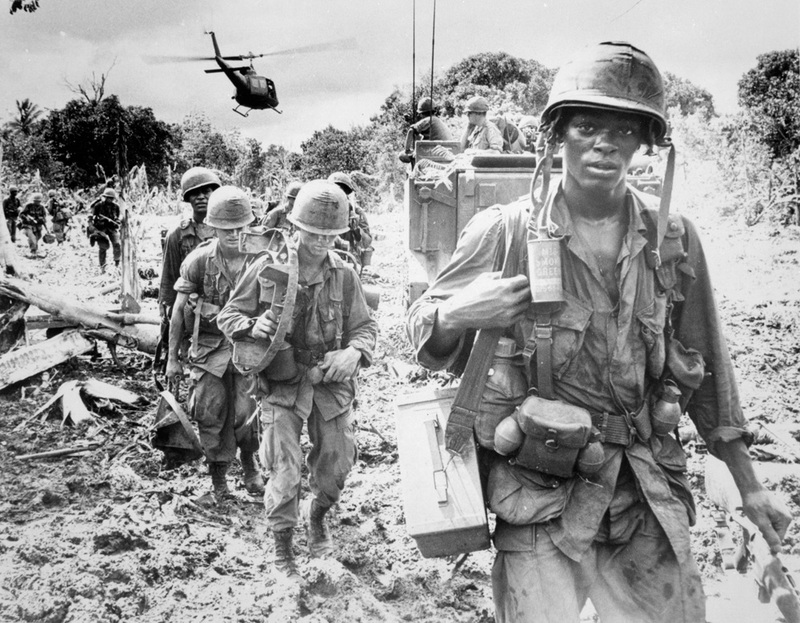 President Johnson’s order to send more troops to Vietnam affected all men between the ages of 18 and 26. 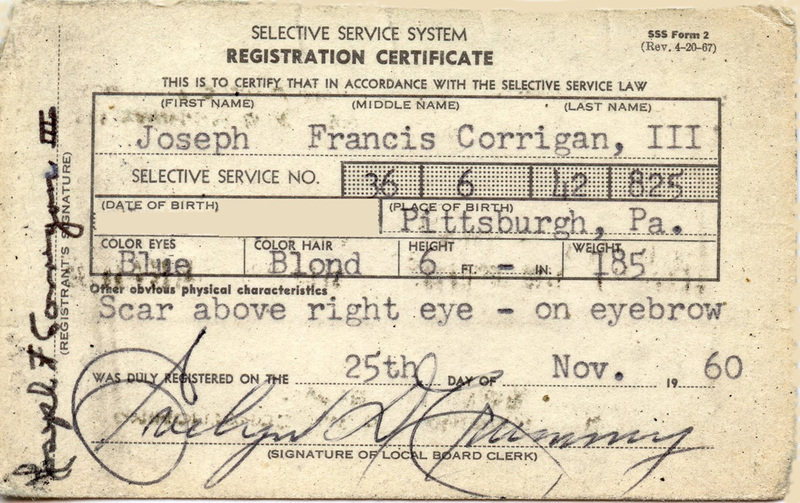 Registration for military service was compulsory. 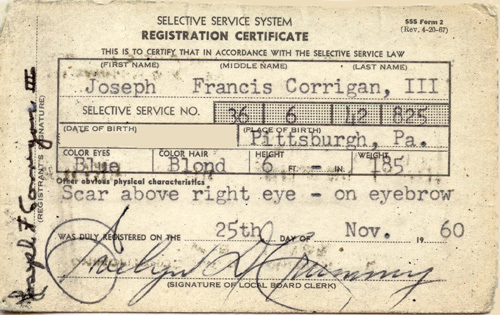 The Selective Service called up only the men needed while excusing the rest through deferments. 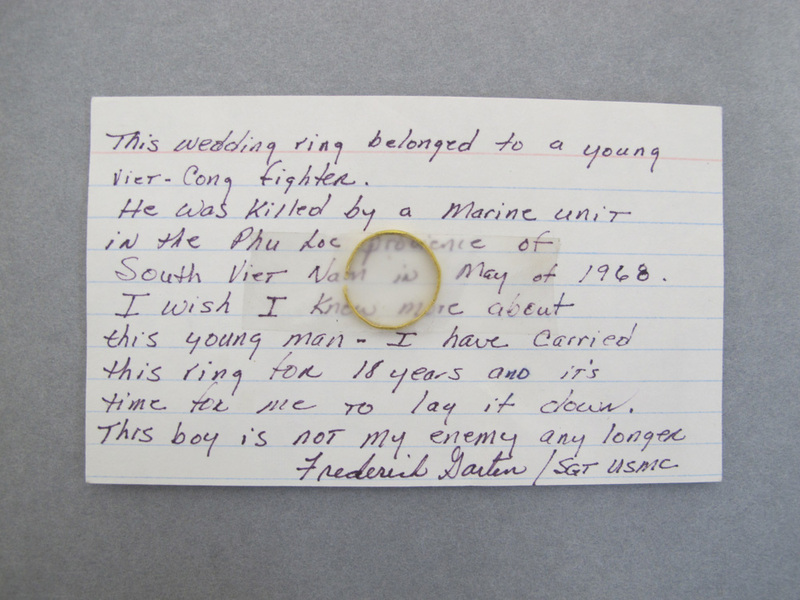 Twenty-seven million American men were of draft age during the war. Forty percent served in the military, and about 2.5 million went to Vietnam. American servicemen initially traveled to Vietnam aboard WWII-era troopships like the General Nelson M. Walker. Nearly 5,000 Marines and G.I.s crowded the Walker on each three-week voyage from Oakland, California to Danang or Qui Nhon, South Vietnam. This canvas came from a berthing unit that was once on the Walker and is covered with graffiti written by the young men who bunked here. 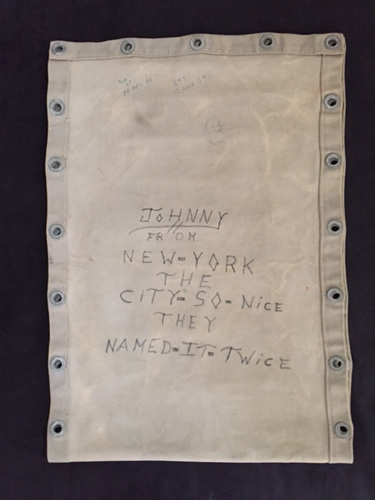 The identity of “Johnny from New York, the City So Nice They Named It Twice” is unknown. 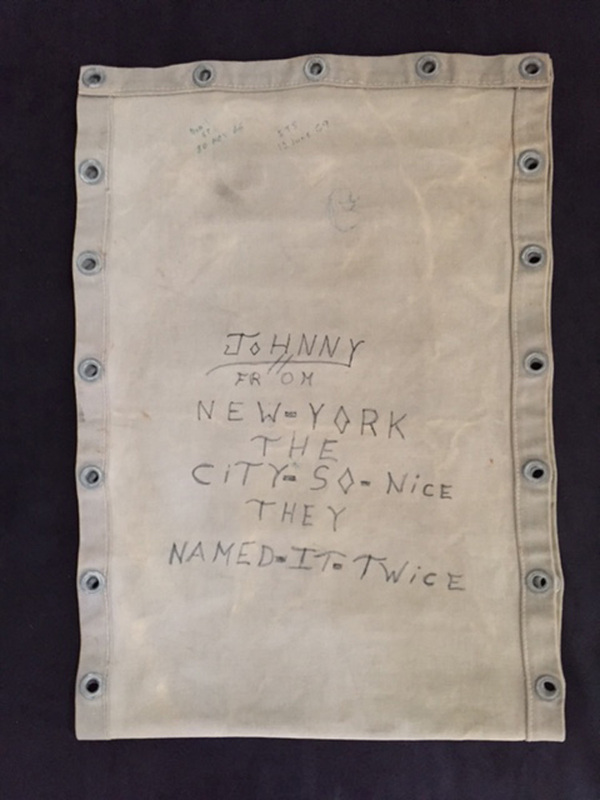 In 1997, the Vietnam Graffiti Project rescued bunks and canvases from the Walker to preserve this piece of the past. An eight-man berthing unit and two additional canvases will also be on display in the exhibition. President Ho Chi Minh was the father of Vietnamese independence. 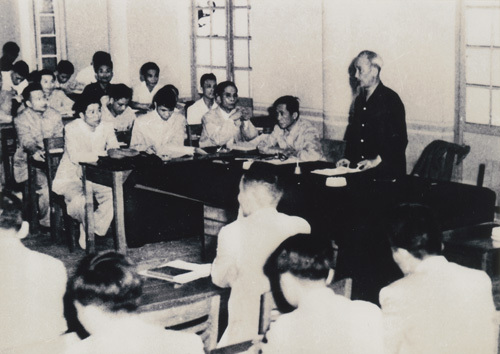 Spurned over the years by U.S. leaders, Ho came to admire Communism for its stand against colonialism. Ho and party leaders adopted Communism as the ideological foundation for the Democratic Republic of Vietnam. 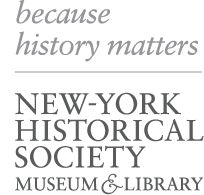 In 1959, Ho and other leaders in Hanoi agreed to support a revolutionary war in South Vietnam. 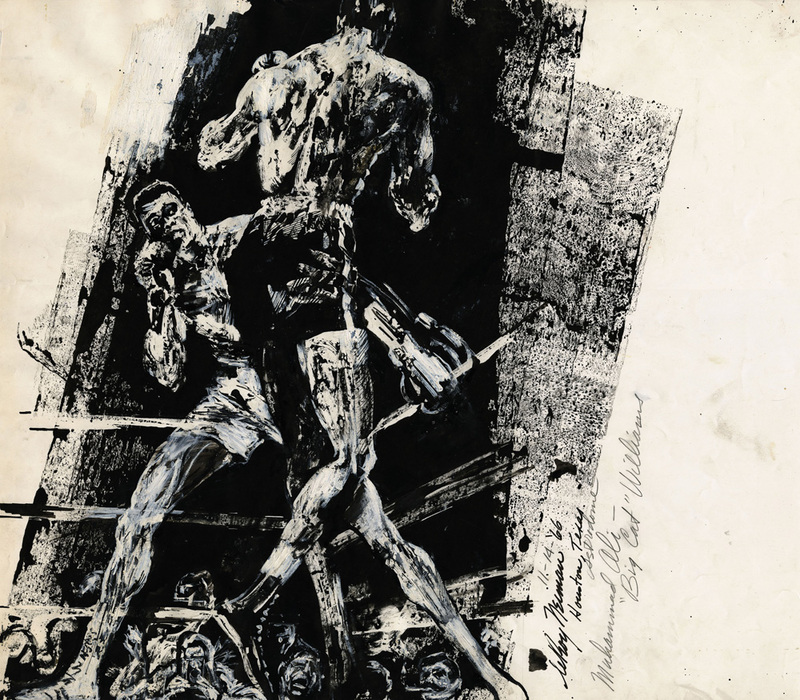 Hanoi art student Tran Huu Chat received high marks in 1962 for his lacquer engraving that depicted Ho Chi Minh and the Viet Minh organizing among the people to depose the French colonialists. Fellow Vietnamese would have understood that the artist was using the heroism of the Viet Minh to symbolically refer to the National Liberation Front, organized in 1960 to oppose the Diem regime and its U.S. backers. The original artwork hangs in Hanoi’s Vietnam National Museum of Fine Arts. 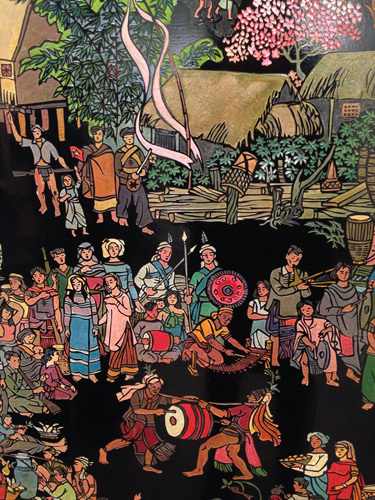 The 84-year-old Tran Huu Chat made an exact reproduction for this exhibition. The primary mission of U.S. forces was to destroy the enemy and their logistical network. American ground troops operated throughout South Vietnam, supported by naval and air campaigns. They defended the DMZ, pursued units in the hills along the Central Coast, combed through Viet Cong base areas in the Iron Triangle, and ranged across the upper Mekong Delta as part of an Army-Navy mobile riverine force. Most U.S military personnel in Vietnam carried Zippo lighters. 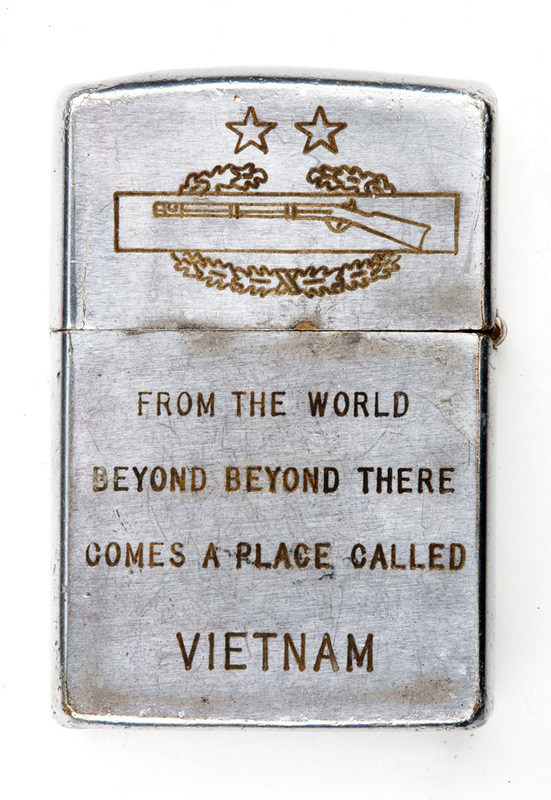 Zippos lit cigarettes, illuminated dark spaces, and were even traded as currency. Engraving messages was a popular practice. Zippos also became symbols of American destruction. In 1965, CBS aired a report featuring footage of Americans engaged in a search and destroy mission using their lighters to burn down the huts of a South Vietnamese village. 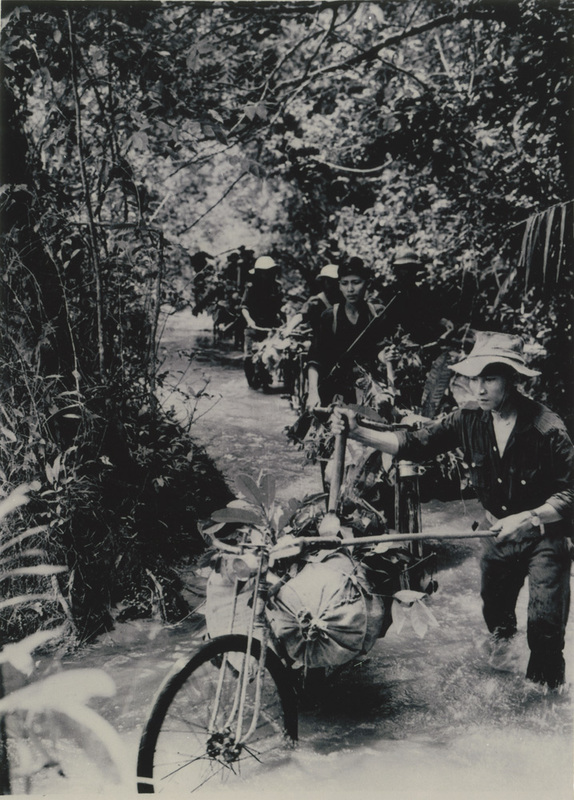 Bikes like these carried food and military supplies from North Vietnam to South Vietnam down the Ho Chi Minh Trail. 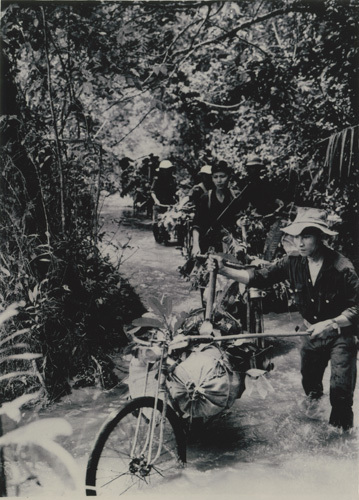 Young North Vietnamese pushed the bikes, traversing hundreds of miles of Laotian and Cambodian jungle and treacherous mountain passes. Foot soldiers walked the same paths. The journey was pure misery, filled with disease, starvation, and danger from U.S. bombs. Helmet cover from Hamburger Hill. Courtesy of Salvador L. Gonzalez, 101st Airborne Division, 3rd Brigade, 1/506th Light Infantry, D Company, 1969. 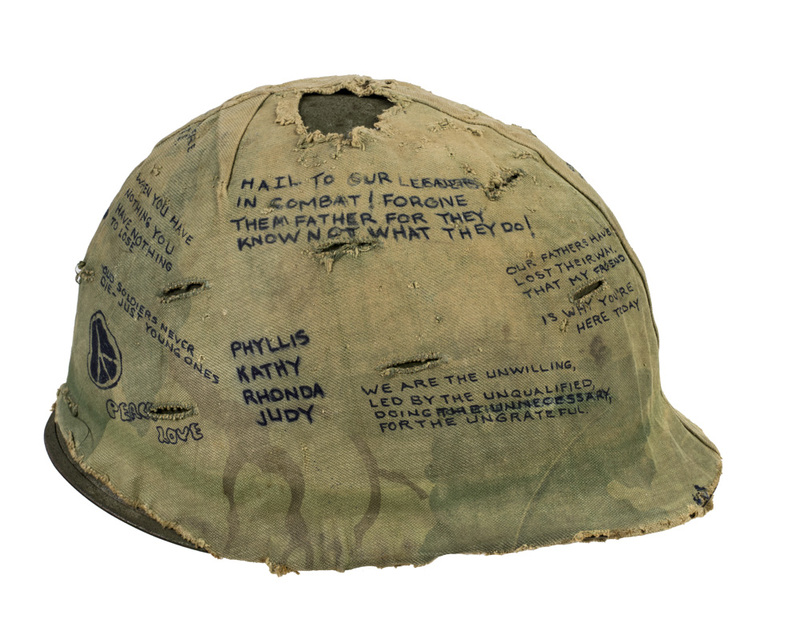 Veteran Sal Gonzalez wore this helmet liner at the meat-grinder battle dubbed “Hamburger Hill.” In May 1969, scores of Americans died or were wounded in repeated assaults up heavily defended Ap Bia Mountain. Tropical “boonie” hat. 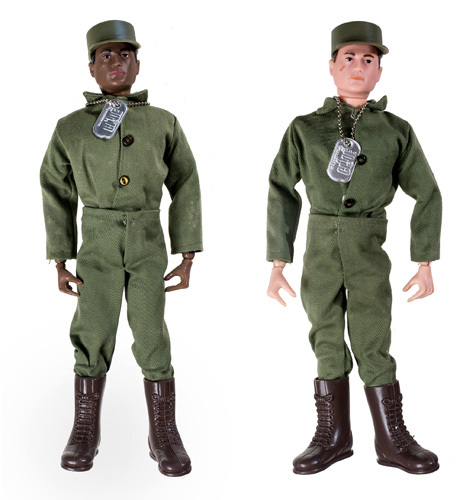 Courtesy of Penni Evans, Donut Dollies, Vietnam, March 1970–71. 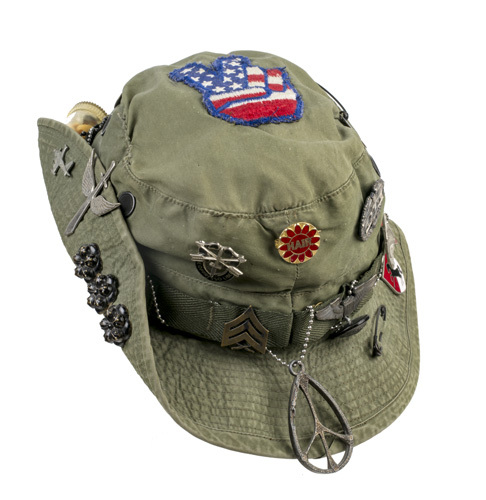 Penni Evans wore this hat when she served in South Vietnam as a Red Cross recreational aide—a “donut dolly”. Donut dollies were female, age 21–24, unmarried, and college educated. Their mission was to create a home front at the battlefront for able-bodied soldiers contending with boredom, loneliness, fear, and sorrow. Some 630 donut dollies volunteered in Vietnam. Many, like Evans, wanted to do something useful and adventurous. Smiling, projecting happiness, and listening to the men were key to their mission. 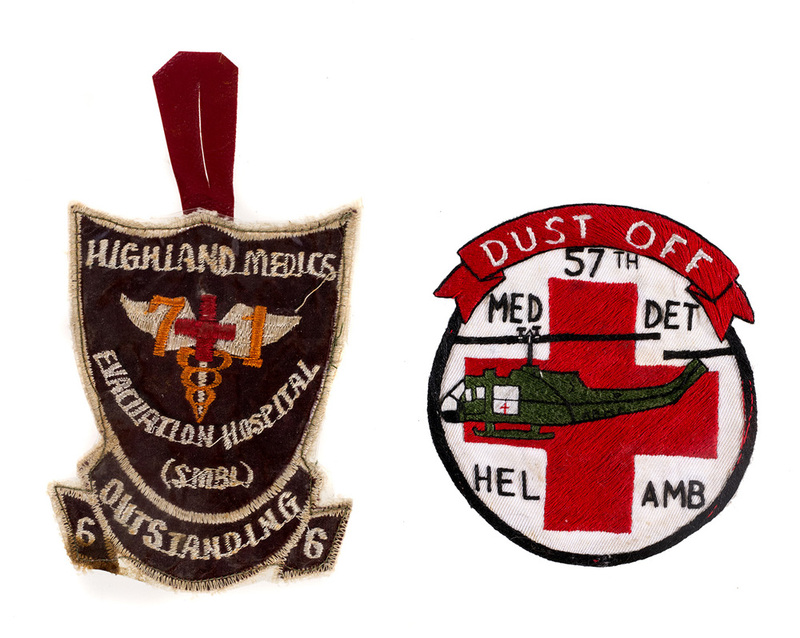 71st Evacuation Hospital patch belonging to Barbara Chiminello (left) and 57th Medical Detachment patch belonging to Thomas Chiminello (right). Courtesy of Barbara, Philip, and Eugene Chiminello. Siblings Thomas and Barbara Chiminello served alongside one another in Vietnam—Tommy as a Medevac helicopter pilot and Barbara as a nurse. These are their unit patches. In October 1967, Barbara received devastating news. Tommy and his crew had all been killed while responding to an urgent evacuation request. In 1967, Muhammad Ali refused to be drafted to fight in Vietnam. He claimed conscientious objector status as a minister of the Nation of Islam. The government charged him with draft evasion and sentenced him to prison. He was also stripped of his boxing title. Ali was both reviled and revered for his antiwar stance. 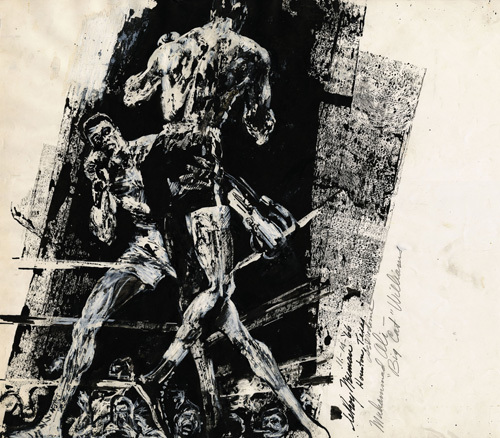 He eventually won his case at the Supreme Court, but for three years he was not permitted to box. This 6’ x 24’ mural, created by artist Matt Huynh, focuses on activity in the United States in 1966 and 1967, with a large focus on the Spring Mobilization to End the War demonstration in April 1967. Hundreds of thousands marched in New York City. From Central Park, the marchers weaved through midtown and were joined by a feeder march from Harlem. The day ended with a rally outside the United Nations where Dr. Martin Luther King Jr., Pete Seeger, and others took the stage. 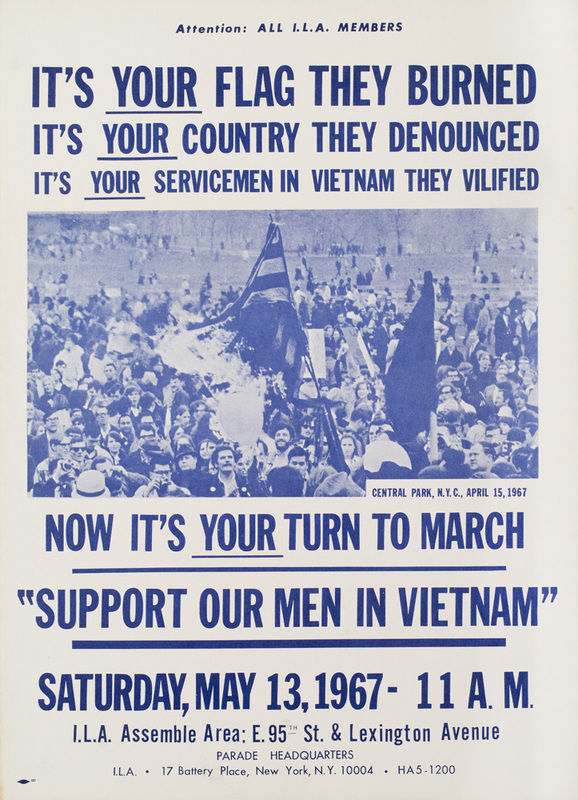 At the time, it was the largest antiwar demonstration in American history. Other scenes in the home front mural include a large prowar demonstration, the continuing impact of the draft and military induction, and veterans’ homecoming. A complementary illustrated mural depicts the war front. 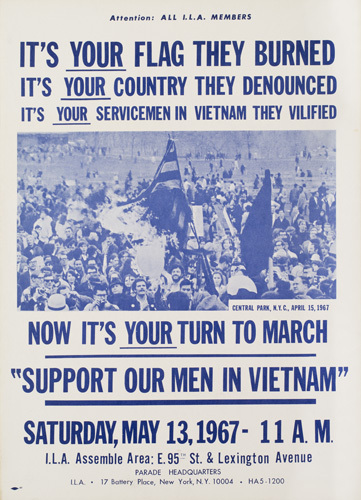 On October 15, 1969, more than a million Americans took part in the Vietnam Moratorium. Across the nation, opponents of the war skipped work and school to attend silent vigils, discussions, and marches. Some took part because they found the war unconscionable. Others believed it unwinnable or unnecessary. Many joined the call for peace for the first time. 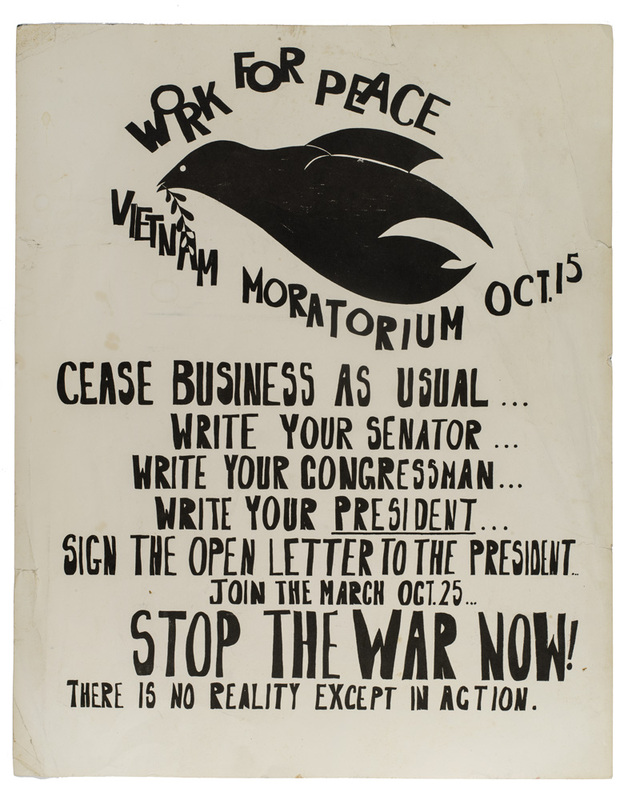 The Moratorium and other multiplying protests worried the Nixon administration. They showed increasing antiwar sentiment among Americans from every walk of life. In 1982, a memorial to the fallen was dedicated on the National Mall in Washington, DC. Known as The Wall, and designed by Maya Lin, the memorial features the names of over 58,000 men and women who died in the war or remain missing. 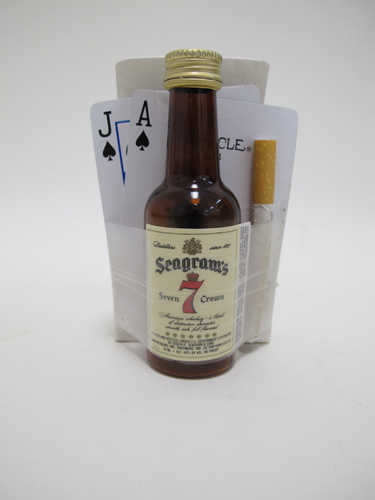 The National Parks Service collects items left there. This and other examples will be on display in the exhibition. 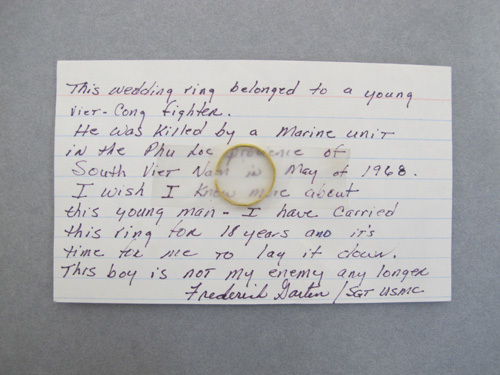 Visitors to the Vietnam Veterans Memorial sometimes leave items or remembrancesThis note with the attached wedding ring of a Vietnamese soldier is among the examples that will be on display at the New-York Historical Society.